Home / Architecture / Book your Prefabulous prefabs tour now! Book your Prefabulous prefabs tour now! 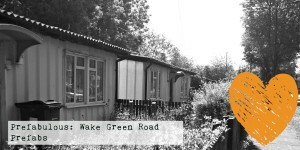 Followers of the Trust’s activities will know that we have recently been out to view the row of listed 1940’s prefabs on the Wake Green Road and we are now able to offer you that same opportunity. As part of Birmingham Heritage week, Birmingham Conservation Trust will be working with the 20th Century Society and the Prefab Museum to open up some of these iconic buildings to the public. The prefabs are currently owned by Birmingham City Council who are kindly allowing us to open up some of the properties for viewings. These wonderful buildings aren’t normally open to the public so make sure you don’t miss this fantastic opportunity to see around them. Whilst they are now in a poor state of repair, you can still see a number of the original features and imagine what they must have looked like when new. The Prefab Museum will be bringing along their mobile prefab archive and are keen to gather memories and memorabilia from anyone who has recollections of life in a prefab; whether those in Wake Green Road or further afield. If you would like to share your memories with the team then please contact us to book a longer VIP (Very Important Prefabber) slot. The Trust are considering taking on the prefabs as a future restoration project and so we will be looking to collect your views on what the future should hold for the prefabs. Are there any dates in 2017 for visits to the pre-fabs please? We are hoping to have an open day but as yet there are no dates in the diary. Keep an eye on our social media for updates.